TD Insurance and Carstar have created a “one-stop solution” at a Canadian body shop that might provide an easier customer experience but raises the question of conflicts of interest with repairs. The pilot program at Carstar Calgary Chinook installs a TD insurance adjuster there, apparently full-time, to work with customers in person and over the phone. 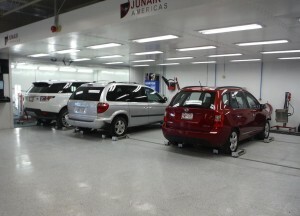 Carstar Calgary Chinook is also increasing that shop’s hours for the program. The initiative means that a driver will “only need to deal with one contact throughout the claims process – the TD Insurance adjuster onsite assigned to the claim,” according to the TD Jan. 28 news release announcing the program, which was to begin Monday. It’s an interesting experiment. Carstar doesn’t have anything like it in the U.S., and it’s a first for TD — and possibly any other insurer — in Canada. It seems to raise all the controversy of a direct repair program and then some. With a traditional DRP, the customer at least gets to hear from the two economically opposed sides. With this arrangement, the customer’s default is to only hear from the insurer. However, customers are still free to exercise their right under Alberta law to go to any shop they want. Repairer Driven News contacted both companies about the partnership with questions including future expansion, how disputes between insurer and repairer would be handled and if Carstar had to make any concessions to get the insurer on-site. Carstar’s Canadian headquarters deferred all questions to TD. TD issued another statement, relevant parts of which have been included above.